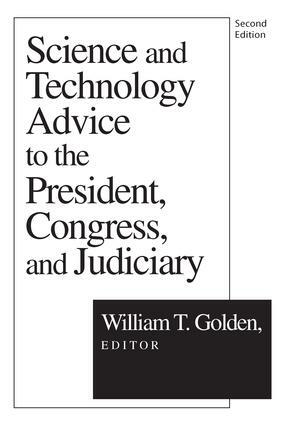 This volume aims to attract attention to the necessity for quality advice on science and technology issues to the president of the United States, to the Congress, and to the judiciary. It emphasizes reconsideration and improvement of existing organizations and mechanisms, mindful of the need to adapt to changing circumstances. Golden has gathered facts and opinions useful to a wide range of people: government officials and staffs in all three branches; journalists; scholars and students of political science, science policy, and the history of science policy; members of the industrial and financial communities; and the concerned citizenry. The eighty-five prominent experts include both of President Reagan's science advisors, President Gerald R. Ford, congressional leaders, and distinguished members of the judiciary. The Science Advisor: Who Needs One? Advising the President on Science and Technology: Why Can’t We Get It Right?